Choose Oil Lift Oil Remover when you need industrial strength cleaning results without the toxic side effects. It is specially formulated for difficult jobs like removing embedded oil stains. This eco-certified, non-toxic, Oil Remover and Multi-Purpose Green Cleaner, penetrates the oil and de-bonds it from surfaces like concrete, paving stone and asphalt. When Oil Lift has separated the oil, soak up the residue and rinse. The natural bacteria in the earth will biodegrade the leftover waste. Due to its powerful cleaning ability and green profile, it can be diluted with water and replaces over 90% of toxic cleaners and solvents. Oil Lift Oil Remover is designed to handle the toughest jobs from oil stained driveways to everyday household & outdoor cleaning requirements. Professional cleaning companies use it for the most challenging commercial and residential cleaning applications. The combination of our industrial strength and eco-friendly formulation makes the Oil Lift Oil Remover the perfect all-purpose non-toxic cleaning solution. Removes oil from parking lots and driveways. Industrial strength and eco-certified for better cleaning results. Replaces 90% of toxic cleaners and solvents. Super concentrated and multi-purpose to save you time and money. for warranty information please e-mail info@oilllift.net or call between 9 am - 5 pm Pacific Standard Time 1-866-5438645. CLR MOLD & MILDEW STAIN REMOVER Removes tough mould and mildew stains. Use in bathrooms, kitchens, basements where mould and mildew stains are present. May be used on painted walls, ceramic tile, hardwood floors and baseboards, fabrics, glass, metal, brick, concrete, marble, laminated countertops, fully cured and oil-based painted surfaces, hard plastics, automobile tires, vinyl tops, wood, grout, and fibreglass. DO NOT USE ON STAINLESS STEEL APPLIANCE EXTERIORS. Concrobium Mold Control is a patented solution that effectively kills and prevents mould and mildew, and eliminates musty odours with no bleach or harmful chemicals. The product works as it dries by crushing mould spores at the roots and leaves behind an invisible antimicrobial shield that prevents future mould growth. Use Concrobium Mold Control for mould & mildew clean-up and prevention, general interior maintenance, water damage restoration and during construction/renovation (paint prep and pre-treatment of building materials). Concrobium Mold Control is a patented solution that effectively kills and prevents mould and mildew, and eliminates musty odours with no bleach or harmful chemicals. The product works as it dries by crushing mould spores at the roots and leaves behind an invisible antimicrobial shield that prevents future mould growth. Use Concrobium Mold Control for mould & mildew clean-up and prevention, general interior maintenance, water damage restoration and during construction/renovation (paint prep and pre-treatment of building materials). The aerosol format is great for hard-to-reach places where the traditional trigger spray would be difficult to apply. Use it under sinks, on ceilings, in cupboards and closets. The aerosol's fine mist applicator is great for use on fabrics, curtains and carpets. It's also great for eliminating musty odours in front load washing machines. Easily removes old dried latex paint, caulking, most glues, marker and pen ink, white correction fluid, crayons, asphalt, tar, lipstick, chewing gum, oil, grease, scuff marks, candle wax, printers ink, tape and sticker residue and more. 2L Industrial Strength Concentrated Non-Toxic Oil Remover Choose Oil Lift Oil Remover when you need industrial strength cleaning results without the toxic side effects. It is specially formulated for difficult jobs like removing embedded oil stains. This eco-certified, non-toxic, Oil Remover and Multi-Purpose Green Cleaner, penetrates the oil and de-bonds it from surfaces like concrete, paving stone and asphalt. When Oil Lift has separated the oil, soak up the residue and rinse. The natural bacteria in the earth will biodegrade the leftover waste. Due to its powerful cleaning ability and green profile, it can be diluted with water and replaces over 90% of toxic cleaners and solvents. 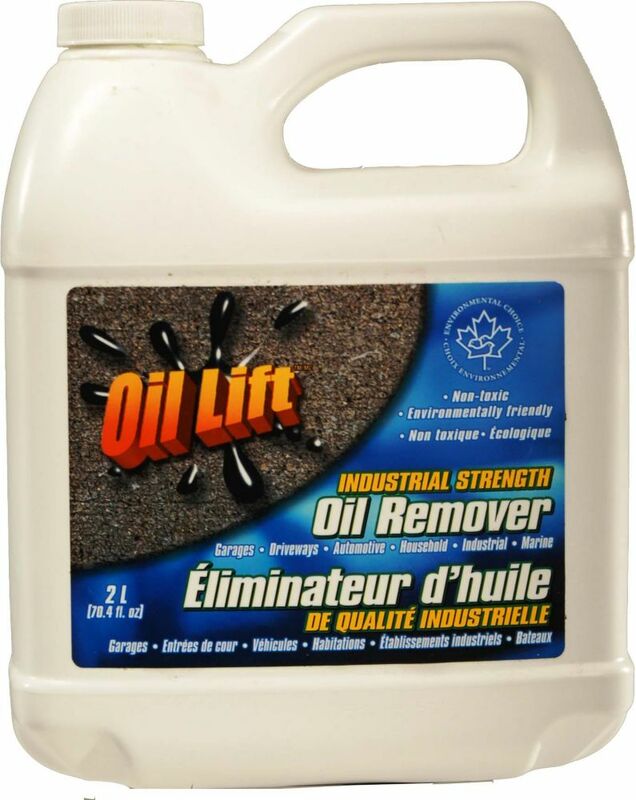 Oil Lift Oil Remover is designed to handle the toughest jobs from oil stained driveways to everyday household & outdoor cleaning requirements. Professional cleaning companies use it for the most challenging commercial and residential cleaning applications. The combination of our industrial strength and eco-friendly formulation makes the Oil Lift Oil Remover the perfect all-purpose non-toxic cleaning solution. 2L Industrial Strength Concentrated Non-Toxic Oil Remover is rated 3.0 out of 5 by 2. Rated 5 out of 5 by Magg from Oxay, so I am impressed! My old car had dripped oil -albeit in very small amounts-on my garage floor for 15 years. I had tried many products, in an attempt to clean the stain. I think you know what is coming next- the garage floor almost looks like it is freshly poured. I poured Oil Lift on the stain, let it sit about 10 minutes, rubbed it gently with a wisk broom,and repeated the process once more, then rinsed with water. It really is nice to finally find a product that actually does what it purports to do. Oxay, so I am impressed! Thanks-it is nice to know that it is non-toxic, too. Rated 1 out of 5 by Steve25 from Terrible For Removing Oil Stain from I bought this product based on good reviews but this product did not work for removing oil stains from grey, interlocking stone, I don't know why it was rated so high. Will this product clean heatin fuel oil from soil?